A few weeks ago, I was driving into Sligo with a friend. The sun was inexplicably shining, and Benbulben, our very own table mountain, was standing over Sligo town, glowing in the dwindling light of day. We both admired it. "You can easily forget it's there, can't you?" It's true. It dips in and out of view, depending on where you are and how clear the day is, but this imposing monster of a mountain is an incredibly cool landmark to call our own. I've been meaning to climb it for as long as I've been here, but never gotten around to it. Then, a few weeks ago, I heard of a rather exciting excuse to do so. Festival season is in full swing in Sligo. We've just had the Jazz Festival, the Fleadh is on right now, Cairde's been and gone and we've just reached the end of Tread Softly, one of the many Yeats events taking place this year. 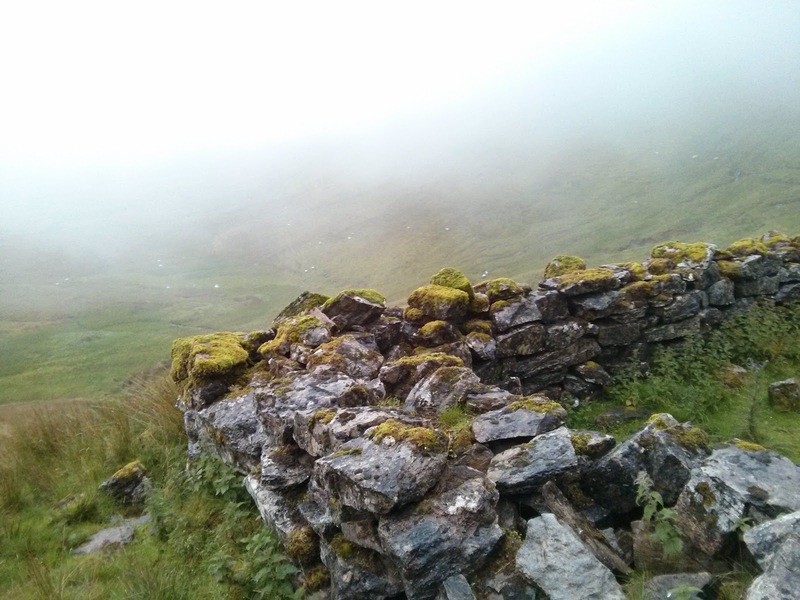 As part of Yeats 2015, Sligo's Blue Raincoat Theatre Company produced A Country Under Wave, a series exploring the theatre of Yeats in different locations around Sligo. But these plays weren't just taking place in theatres. 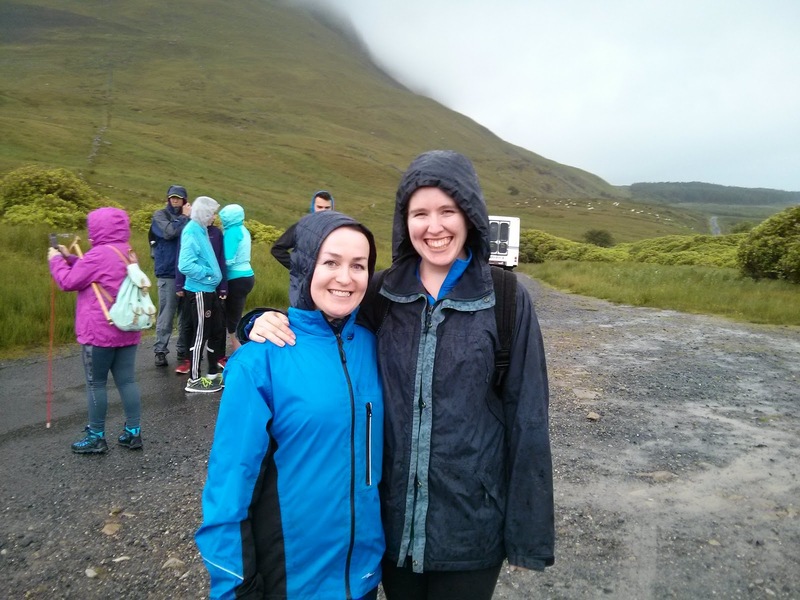 They were by lakes, on beaches, in pubs and... up Benbulben. 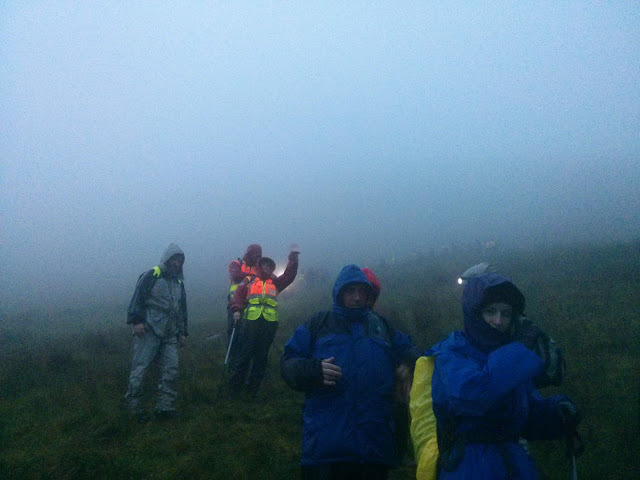 In association with Sligo/Leitrim Mountain Rescue, who organise an annual night hike, the group were putting on a production of Purgatory at the peak of the stoic mountain, come rain or shine. When the day arrived, it was pretty bleak. So bleak, in fact, that Benbulben appeared to have disappeared. All the mountains had disappeared. Everything more than ten feet away had disappeared. Rain hammered down relentlessly, as I repeatedly assured my friend Dee that it would clear by the evening. Texts were sent to me by non-attendees with hourly, smug weather predictions - all featuring angry, grey clouds with plentiful raindrops coming out of them. Dee asked so frequently if it had been cancelled yet that I banned any more mentions of it. "They'll call if it's cancelled. They'll call!" So off we went to the mountain, waterproofs on and spirits high. We're adventurous! We're outdoorsy! We're probably not going to slip to our deaths! Before we began the ascent (which we were told would take around 2 hours) we were given a safety briefing by mountain rescue. The trouble was, I could barely make out the sound of her voice among the heavy drops of rain falling on my hood. It was the kind of all-encompassing rain that penetrates every fibre of your being. My eyelashes were wet. And we'd only been out of the minibus for three minutes. 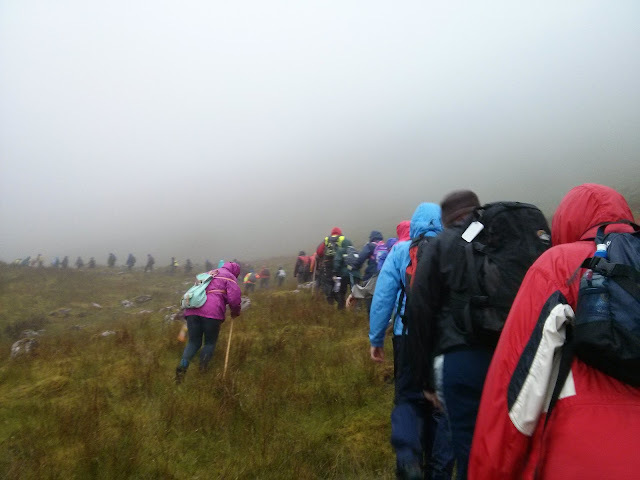 We began to trudge up the mountain. 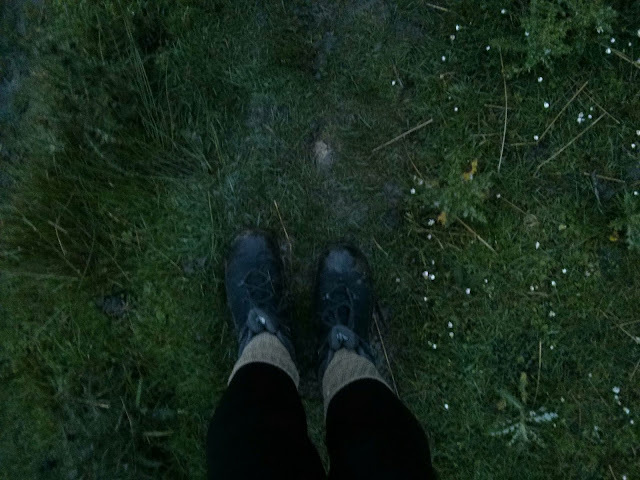 A wide path became a boggy track, which became a wide open expanse of soggy, sludgy marsh. Occasionally I turned to admire what would usually be an impressive view... only to be met by fog. Or maybe it was cloud. Every so often, we reached little rivers that we had to hop over. I remain insanely proud that I didn't fall in. The rain wasn't fading. It fell continuously, bouncing off of our heads and creating a waterlogged path for us to trudge through. Waterproofs proved themselves useless within minutes. I knew that I was wet through. My hiking boots had collected a pool of water, which was heating up as I hiked. It was actually quite nice after a while, like a bubbling little foot spa. Funnily enough, a split second after I took this vain picture of my own feet, I nearly fell due to a lack of concentration. It soon reminded me of an episode of 999 Lifesavers. 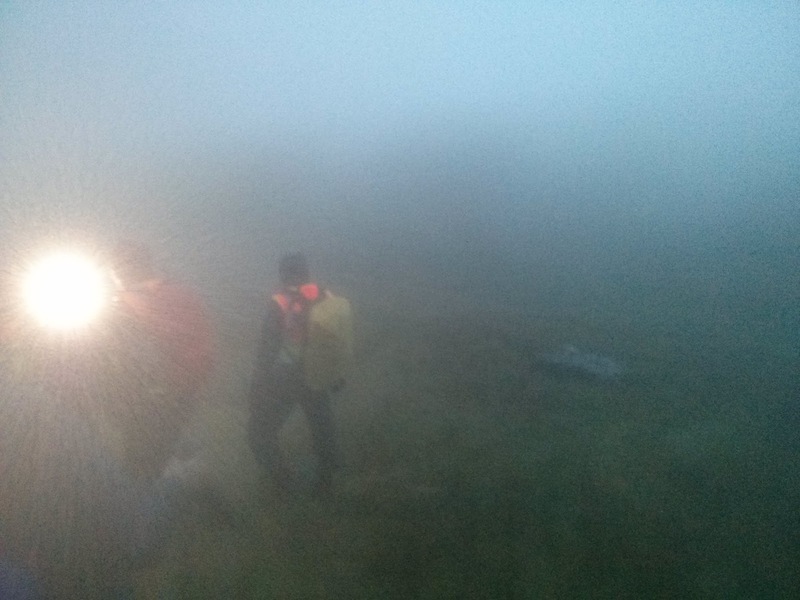 The floodlights and rescue guys carrying tanks of oxygen didn't help. I was starting to think that if we did get to the top, and stood still for any amount of time, we'd be screwed. In a situation like that, you don't really feel the cold until you stop moving. If we kept on trucking, we'd be fine. "PITTER PATTER PITTER PATTER down PITTER PATTER PITTER PATTER danger PITTER PATTER PITTER PATTER reschedule PITTER PATTER PITTER PATTER slip PITTER PATTER PITTER PATTER"
I think I got the gist of it. It was far too dangerous for us to stand at the top of the mountain, in a storm cloud, and watch a play. We'd given it a fair whack, but it was time to head back down. 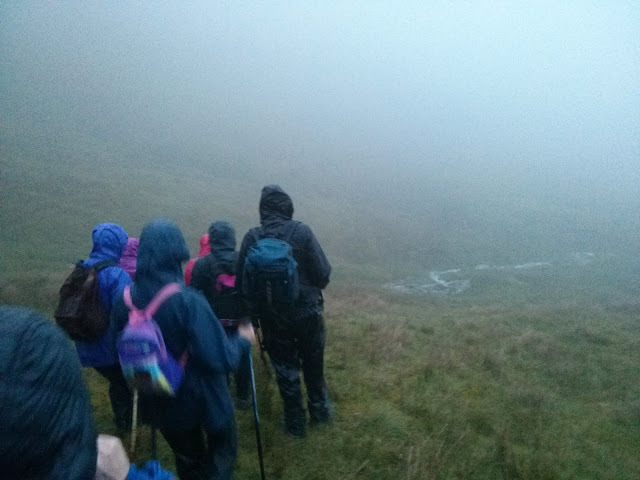 To head back down the slippy, sludgy, steep mountain. I got a spell of giddiness, and started a game called Wet, which really just involves saying every single word for wet you can think of, back and forth. It can carry on for quite a while, actually. Then I tried to think of every song that mentions the rain. Again, it's a game that can distract you for a long time. We stopped for a few minutes in a makeshift tent when we were close to the bottom. It was almost entirely dark by this stage, and I started to think strategically. We were near the front of the group (purely because we were at the end going up) At the car park, we'd be met by a minibus that would take us back to base. There were too many people for this to be a one-trip deal. This was a 'not enough lifeboats' situation. I whispered my realisation to Dee, so we hot-footed it on, ignoring the tea and biscuits, and got to the bus just in time to nab the last two seats. It was then that I realised by theory about stopping still was utterly correct. I sat on the bus and finally realised just how cold and wet I was. I'd become Leonardo DiCaprio at the end of Titanic. I tried to make a lighthearted joke about sending a strongly worded letter to the White Star Line but I just couldn't do it. I couldn't speak. I couldn't joke. All I could think about was showering and getting into bed. Oh, and eating. When we got into the car, we tried to strip off to dry layers, but we had none. I remembered that I had a spare jumper in my backpack, but alas, it was soaked through. Everything was soaked through. It was 11pm, and the only source of heat we had were the two large pizzas that we soon had placed on our laps. I could have cried. I really, honestly, could have cried. We ate a steaming hot slice in the car, and headed home to our warm, dry beds. Dramatic as I've made it sound, it's an adventure I'm glad I've had. I can't wait to climb Ben Bulben properly, IN THE SUN, and luckily there have been many other outdoor plays from the Blue Raincoats on in the area. 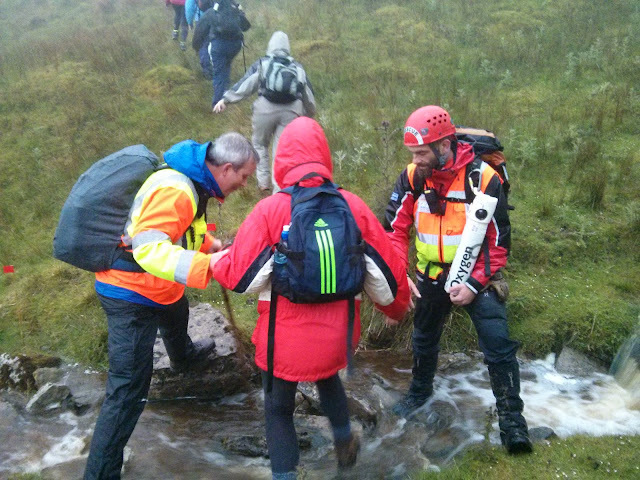 The Sligo/Leitrim Mountain Rescue Team do amazing work, and you can see more about them (and donate) here: www.sligoleitrimmrt.ie. They usually organise a Night Hike once a year, so keep an eye out for that.